Yum! 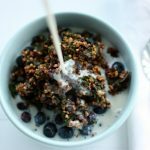 Granola is one of my favorite things around, and I love making raw versions with buckwheat. 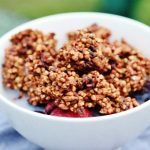 They’re easy to adapt with different flavors and mix-ins, and the buckwheat gives them incomparable crunch. I’ve been on a raw-nola roll lately, and today’s recipe is the latest and greatest creation. It’s a relatively simple raw-nola, but hints of cinnamon and coconut make it special. As with all raw-nolas, I’ve been enjoying it with homemade almond milk, with fruit, as a snack (dry), or with my coconut yogurt. Since many of you have asked about a baked option, I did test this recipe in the oven, too, and have given instructions below! Note that the buckwheat will get relatively firm after baking, so prepare yourself for some colossal crunch! 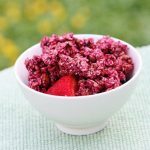 Mix the buckwheat, coconut, almonds, cinnamon, and flax together in a mixing bowl. Blend together the almond butter, water, and coconut syrup. Pour it over the dry ingredients and use your hands to mix it all thoroughly. 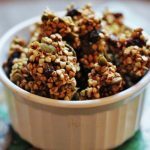 Place the granola onto a Teflex-lined dehydrator sheet (you can use parchment paper in place of Teflex) and dehydrate at 115 degrees for four hours. 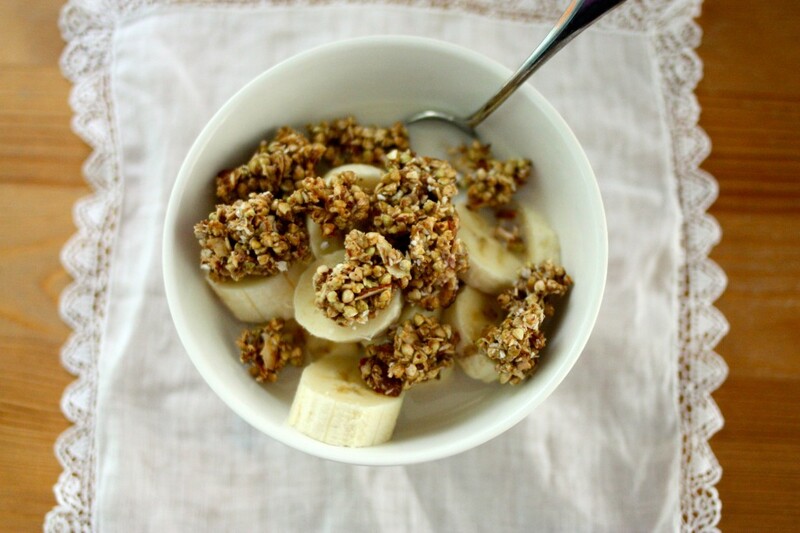 Mix the granola up a bit and break it apart on the sheet. Dehydrate for another four hours, or until totally dry. Alternately, you can toast the granola at 325 degrees for about twenty-five or thirty minutes, or until it's golden and fragrant. Allow it to cool completely before serving; it will firm up as it cools. I hope you enjoy this crunchy, tasty treat as the weather continues to cool off! In the meantime, I look forward to seeing you back here tomorrow. So jealous of your trip! Hope you’re having a blast. Not to be cliche, but it has been totally life changing! I highly recommend giving up all your stuff and ditching to another country at least once a lifetime 🙂 Just like you did for your post bac! I just got rid of my dehydrator because I never used it! Wondering if this could be done in an oven–I know it wouldn’t be considered raw, but I don’t care. 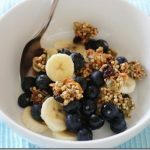 Funny, because this looks very similar to my breakfast this morning–something about bananas, granola, & milk that is soo satisfying. Got rid of it?!?! Oh man, sad face. They are so useful for snacks. But I give a baked option in the recipe, below the dehydration option, so you’re good to go. I know, I was sad to let it go, but I had to be honest with myself. In the 5 years that I had had it, I only used it a handful of times. I’m trying to let go of anything I don’t actually use very much & only keep the essentials. But yes, it does make me a bit sad (I had an excalibur!) especially when I see a recipe like this. Yum, this looks so tasty! I really have to get myself a dehydrator…. I love your beet hemp granola but mine wasn’t “raw-nola” as I had to use an oven. This new recipes sounds fab. You know I’m a fan of anything coconut! Need to make this! Audriana would LOOOOVE (as would I!)! 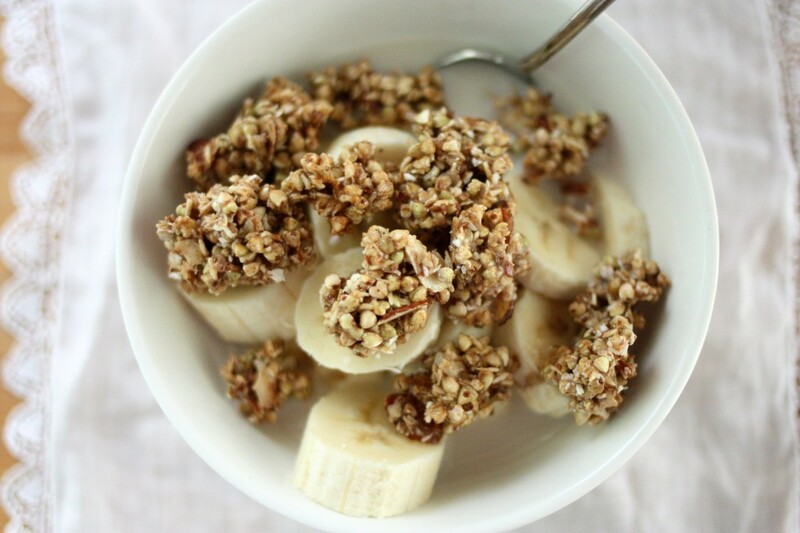 I’m out of granola and need to make a batch tomorrow, so this is perfect timing! Making the dehydrated buckwheat is such a PITA, but it really is the most important ingredient, I’ve found. It sure is. I hope you enjoy!! This makes me wish I was waking up on your couch again tomorrow morning. Tasty with the coconut yogurt! This is my favorite new treat. Absolutely delish!!! Thanks for sharing! This sounds great! 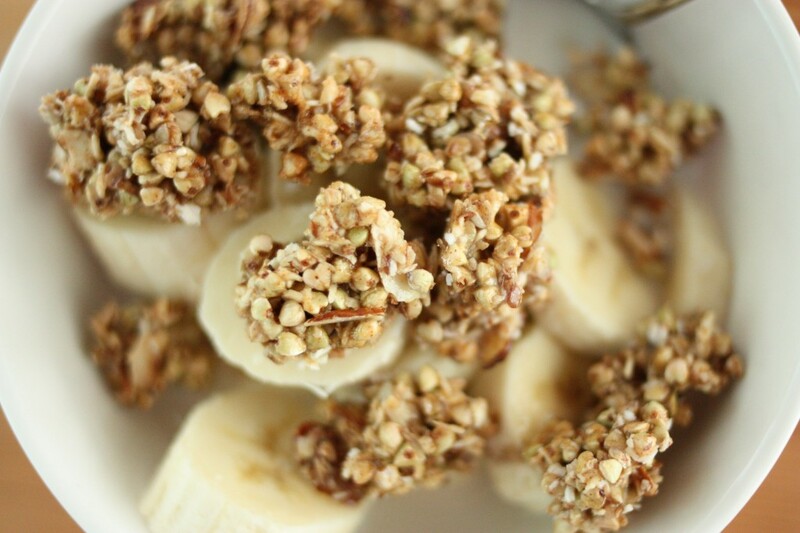 I usually make the same granola over & over – I should switch it up. And I already have a batch of buckwheat crispies ready to go! Can you leave out the flax meal? Also, would honey work for this recipe? Hi! Love this stuff! 🙂 Best granola I’ve ever had. Just wondering what you’d consider a serving size/portion? I know this is full of healthy nutrients and good fats, but it’s quite a calorie bomb and I’m trying to watch my intake. Thank you!! Your site is amazing. Being a busy mum with two little kids I made some slight changes… I used 150g buckwheat which I soaked overnight and then sprouted for 24h. Didn’t dehydrate it and just mixed it with the other ingredients as mentioned in your recipe. I also added 1/3 cup of pumpkin seeds, which I soaked overnight, as well as the almonds. Having no flax meal, I added the flaxseeds to the blender with the liquid ingredients. Having used more wet ingredients than indicated in your recipe, I have first started dehydration at 145F for 1 and 1/2 hour, and then continued on 115F for approx. 8 hours. The result is wonderful. Thanks again and have a wonderful day !